After closing on a new home, we all seek the peace of mind in knowing that the hardest part of the home buying process is now behind us. The last thing we want to worry about is constant upkeep and maintenance of our newly built home. Lucky for you, part of our Minto Home commitment is that as long as you live in your Minto home, you can rest easy with the MasterCareSM program. What exactly does Minto’s MasterCareSM program include? 1. Meet Your Builder: After signing your purchase agreement and completing your design selections, you’ll have the opportunity to attend an orientation and meet your MasterCareSM representative who will educate and involve you in the creation of your new home. 2. Quality Assurance (QA) Checks: Minto performs a series of QA checks throughout the construction of your home to ensure that all aspects of construction are in order, that your selections are properly installed, and that your home meets Minto QualitySM standards. 3. 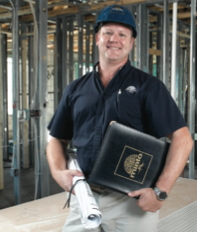 How We Build: Your MasterCareSM representative will meet with you to review your design selections and the structural and mechanical systems of your new home, and show you the quality construction and attention to detail behind the walls prior to drywall installation. 4. New Home Celebration: Prior to closing, your MasterCareSM representative will demonstrate the features of your new home and offer useful maintenance tips. 5. Closing Day Celebration: Congratulations! Today we present you with the keys to your brand new home. 6. Homeowner Education: Minto provides opportunities for you to learn about homeownership and your new home. on the maintenance and warranties of your new home. performance in each and every aspect. 7. Quick Response: MasterCareSM provides emergency service for those after-hour situations that might arise unexpectedly, so rest assured you can always enjoy complete peace of mind in your new Minto home. 8. Move-In Visit: About one month after closing, once you’re comfortably settled into your new Minto home, we’ll arrange a visit to provide answers to any questions, ensure your new Minto home is fully performing to expectations, and provide maintenance tips for your convenience. 9. Mid-Year Visit: We’ll visit your home and conduct a complimentary maintenance check-up. Our technician will answer any questions you may have regarding upkeep and maintenance. 10.Year-End Visit: At the end of your first year of ownership, we’ll conduct another walk-through of your home and provide maintenance tips, reminders and suggestions.